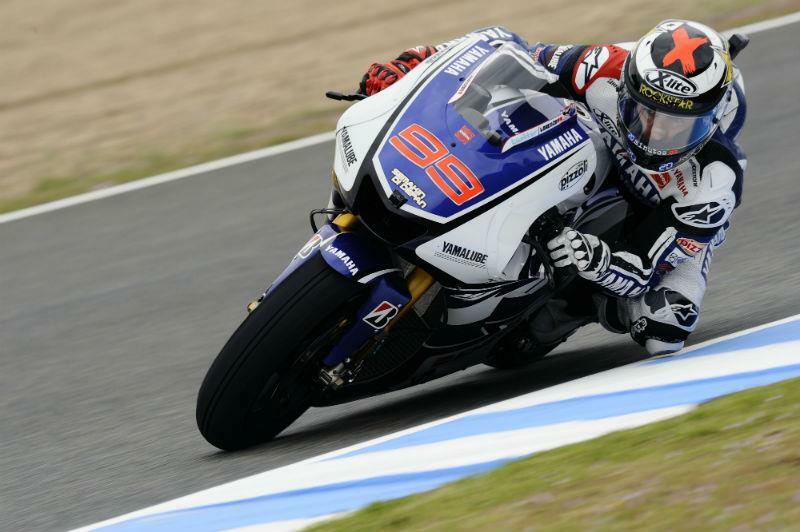 Factory Yamaha rider Jorge Lorenzo will start tomorrow's MotoGP race at Jerez from pole position. Lorenzo took advantage of the drying track to take pole position on his final lap of the session. Compatriot Dani Pedrosa will start from second on the grid after battling with Lorenzo throughout the session for pole position. Factory Ducati rider Nicky Hayden takes the final place on the front row, while team-mate Valentino Rossi will start from 13th on the grid - the slowest prototype rider. Aspar Aprilia rider Randy de Puniet was the fastest CRT rider, qualifying in tenth position ahead of the prototype Ducatis of Rossi, Hector Barbera and Karel Abraham. Brit Cal Crutchlow heads the second row, despite a crash towards the end of the session. World champion Casey Stoner again struggled onboard his factroy Honda, qualifying fifth. James Ellison starts from 20th on the grid ahead of Colin Edwards, who crashed as he was caught out by the conditions.